It's not often you can say a recipe was inspired by star of musical theatre Michael Ball. On the Great Sport Relief Bake Off (side note: that was months ago; how is Sport Relief STILL GOING? ), he created a hot toddy traybake with whisky, lemon and cloves. While I applaud the idea, cloves are only good for toothache. And why no cinnamon and ginger, Michael? A missed opportunity. No wonder you didn't win. 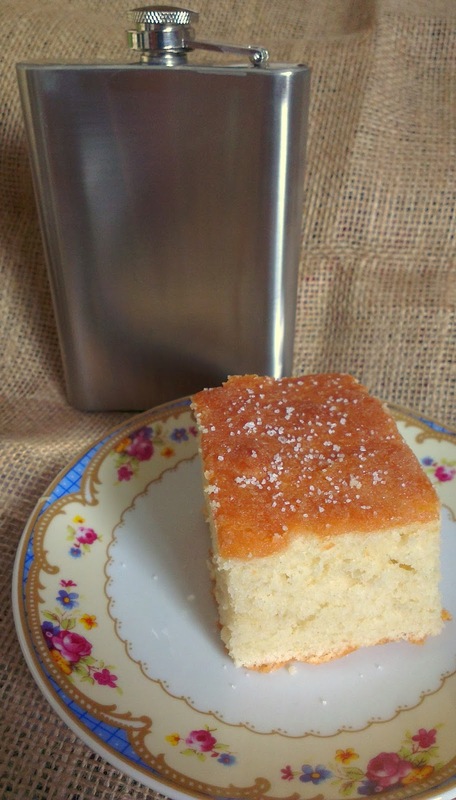 If you've got a choice of whisky, go for a bourbon - its rich vanilla notes go perfectly with this cake. If you want to omit the booze altogether, substitute for 2 tsp of vanilla essence. Preheat the oven to 160C / 325F / gas mark 3. Line a deep, medium-sized tray or roasting tin with baking paper. Put all the traybake ingredients into a food processor and blitz for 5 minutes, until the mixture is smooth and well-combined. If you're doing it by hand, then be prepared to put some serious elbow work in. You'll probably have to listen to Michael Ball do his song again. Tip it into the baking tray and level off the top with a spatula. Bake for around 35-40 minutes until golden brown and springy to the touch. Leave to cool in the tin for a few minutes, then remove the paper and transfer to a wire rack. Leave for around half an hour until just warm, then mix together the lemon juice and sugar and drizzle over the top. I used to have a bit of a crush on Michael Ball (OK, still kind of do) and even went to one of his concerts! I have a crush on this traybake now, too. Cor! I used to fancy him a bit too. He was a very non-threatening crush to have. I have an altogether more embarrassing Michael crush: I used to fancy Michael Bolton. I HAVE ALL THE INGREDIENTS! This is so exciting. To the kitchen! Are you confusing your kitchen with the Batcave again? You don't think Alfred went back upstairs every time Bruce Wayne wanted a snack do you? The Batcave has all mod cons. ... knickers, just remembered I have a brisket in the oven and won't be able to bake cake for hours. I am only missing the bourbon. This seems like as good a reason as any to go out and buy a bottle of bourbon.